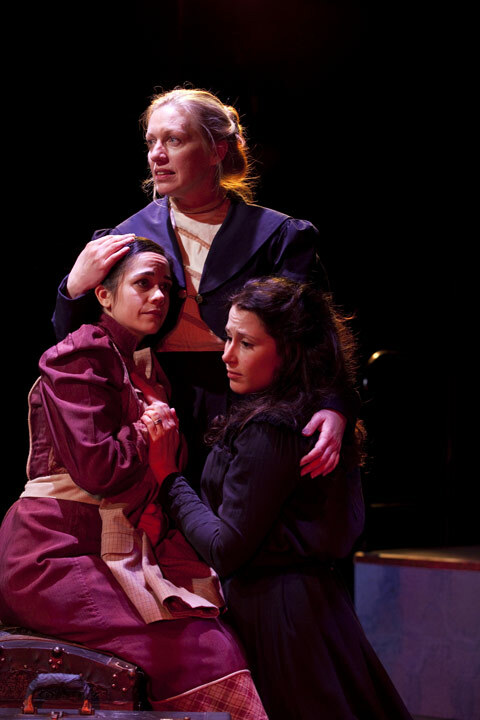 Constellation’s Theatre Company’s new production of his Three Sisters finds some levity amid its pervasive existential gloom, but not nearly enough of it to prevent this handsome but staid production from feeling like a march through the Russian winter. That isn’t automatically a reason to stay away, but we don’t feel the weight of its tragedy, either — the characters seem to be miserable mostly because their creator says so. The result, despite a handful of memorable performances, feels listless and underdeveloped. A chronicle of malaise and compromise among the Russian upper class, the play is a complete expression of Chekhov’s character-and-subtext driven ethos of drama. It’s 1901, and the clan Prozorov is living in a rural town distinguished only by the presence of a garrison. The three sisters (and their brother, too) all want to go back to cosmopolitan Moscow, where they grew up, but they keep company with the soldiers to stave off the boredom they (and the troops) discuss openly. Irena, youngest of the sisters, and Tuzenbach, a lieutenant who’s stuck on her, dream aloud of a more egalitarian society, romanticizing the dignity of labor the way overworked Americans romanticize vacations. Middle sister Masha is trapped in a loveless marriage and takes up with the soulful Lt. Col. Vershinin, whose become inured to his own wife’s regular suicide attempts. Their fortunes and those of the play’s many, many other characters, unravel by inches over the course of five years of their time and three hours of yours. Director Allison Arkell Stockman has plenty of experience wrangling huge companies in complicated scenes, but here it’s the two-person moments that are most transporting. When Masha and Vershinin (Catherine Deadman and Michael John Casey, both terrific), are alone together, you feel the room’s temperature change. Brian Hemmingsen is avuncular and sad as an aged Army doctor who’s forgotten his medical training. As a volatile captain forever trying to mask the stink on his hands with emergency applications of cologne, Mark Krawczyk is believably unhinged. Other personnel choices are more questionable: Admittedly, Chekhov has put directors in a bind by describing Tuzenback as so homely that his appearance literally makes the eldest sister weep. But Billy Finn, the actor in the part, might be the handsomest dude in the ensemble. Maybe that’s Stockman’s way of tipping us off that mere words aren’t to be trusted in Chekovland. If so, the production could have benefitted from more such bold inversions. Three Sisters is at Source, 1835 14th St. NW, through Feb. 21. Tickets are available here. This entry was posted in theatre and tagged Anton Chekhov, Constellation Theatre Company, The Washington Examiner, theater. Bookmark the permalink.